One of my favourite foods is pasta and that’s why I cook pasta pretty often. 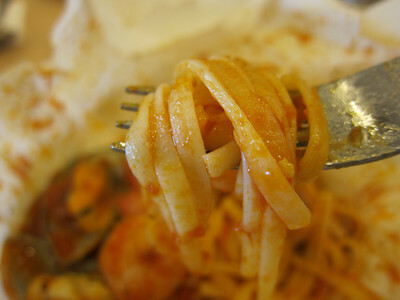 I enjoyed eating pasta, for indulging in the great eating pleasure out of its simplicity. It’s not limited to just my own pasta cooking, but I loved having great pasta when dine out, too. When I heard the name, Parchment Pasta, first thing came to my mind had to be the parchment paper. And I guess, some will even be reminded of the Chinese paper-wrapped chicken (纸包鸡) which uses similar parchment paper for the cooking. 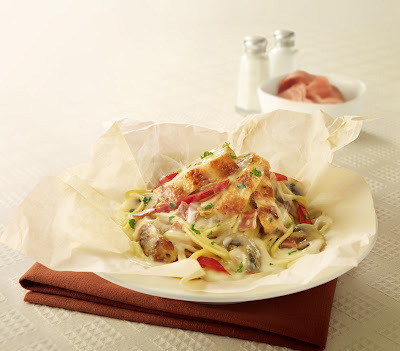 Yes, these new pastas in Pizza Hut are wrapped and cooked up in the parchment paper, or called it, En Papillote, which simply means “cooked in paper”. I think it’s really a brilliant idea to adopt this in cooking pasta when I realized how much it helps in sealing the original flavour, and retaining moisture and tenderness of the ingredients in the Parchment Pasta, after tasting it personally. And, not to worry for having some kinds of excessively oily food like the paper-wrapped chicken, these parchment pastas were baked through and not deep fried, for sure. 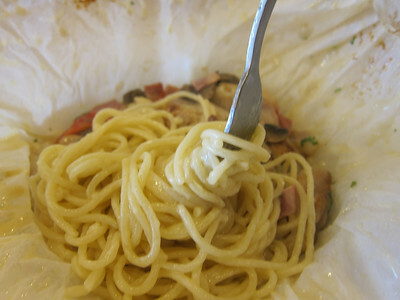 What a unique way for having pasta… This pasta was nicely wrapped up with the parchment paper when served. 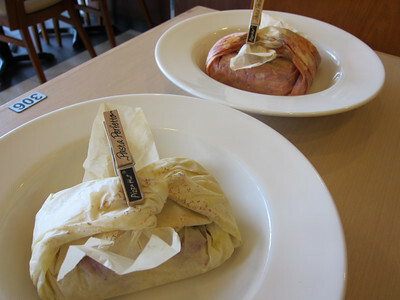 I liked the ‘wrap-up’ presentation as it makes the serving looks mysterious and neat on the table. 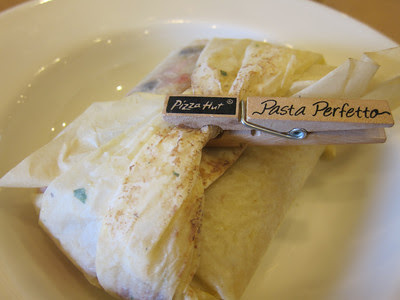 As a first-timer for trying this interesting Parchment Pasta, I simply couldn’t wait to reveal the under wrap! 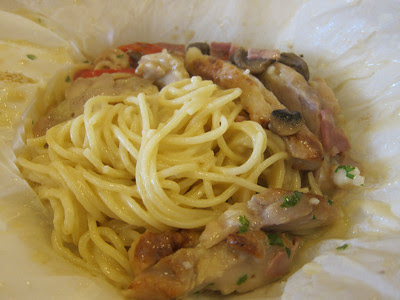 To be more specific, I loved its combination of fresh button mushroom slices, capsicums stripes and turkey bacon pieces together with the excessively tender char-grilled chicken chunks in this cream sauce Parchment Pasta. 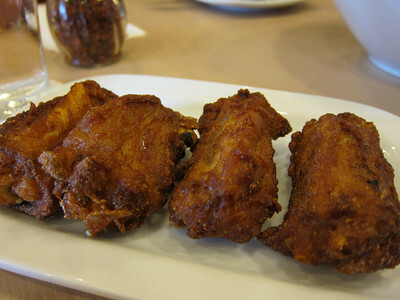 It’s true that the chicken meat tasted so moist and tender, yet, it was so well cooked. Credit goes to their open-secret of baking the pasta through in parchment paper that makes it happened! As for the pasta noodles, the strands were bouncy (we referred it as, so ‘Q’) to bite. Not being too tough or too soggy in the palate, the noodles were considerably al-dente, to acclimatize to the local preference, I supposed. A delicious and accommodative twist on the standard tomato sauce pasta, here they have the spicy version. 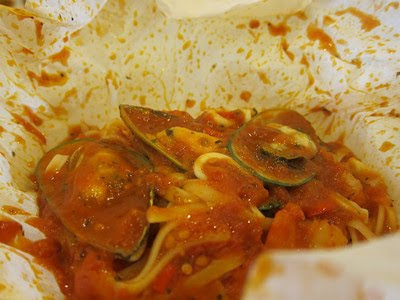 This Spicy Seafood Parchment was cooked with some chopped bird’s eye chilli which adds extra zings to the palate. 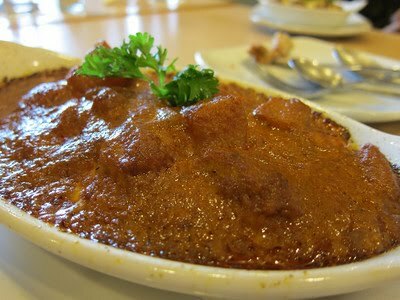 I really did relish its spicy and less-sourish tomato sauce. 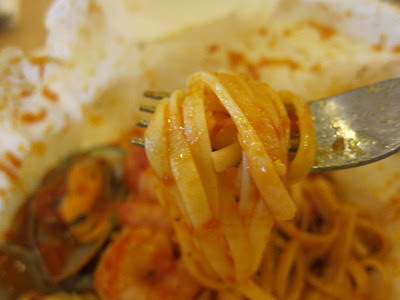 With the combination of spicy and zesty flavours, it balances up the overall flavour in this imaginably tasty seafood parchment pasta in a perfect manner. For those who can’t take it too spicy, you may request for a reduction on spiciness. 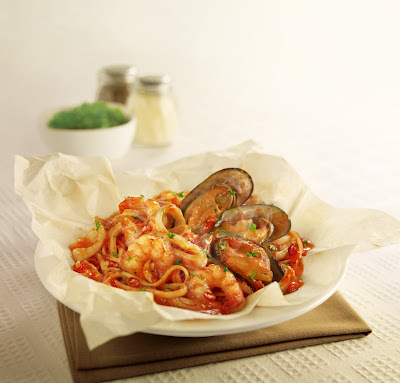 Look no further if you are a seafood lover, like me, this spicy tomato sauce linguine pasta is served with mussels, prawns and squids. It has definitely made a statement with these succulent seafood ingredients where fleshy mussels and interestingly bouncy prawns are found. Even the squid slices were tender enough to chew. And, like I mentioned, all the natural flavour of these juicy seafood ingredients were perfectly sealed in, from the effect of “En Papillote”. As for the pasta noodles used for this dish, linguine simply makes a ideal staple as it allows the hearty tomato sauce to be fully absorbed into each and every of the broad strand. As such, I devoured these parchment pastas with gusto! It’s regardless if you prefer an authentic Italian flavour or the local accustomed taste, you can always find a different dimension in these parchment pastas with the tasty combination of flavours found in it. 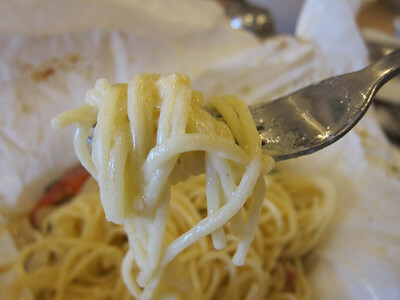 Look at this delicate and balancing cream sauce based spaghetti pasta. Then, comes the exciting robust and zesty tomato sauce based linguine pasta. You’ll find the wonders of both worlds on this Italian fare, lending a refreshing sense of originality to the new creations. Indeed, these new Parchment Pastas were delectably captivating where its true flavour arrives beyond my initial expectation. The overall flavour and its combination of ingredients in each pasta dish were just so perfect. Moreover, with the slight addition of chopped coriander, it enhances the aromas and taste of the pasta even further! 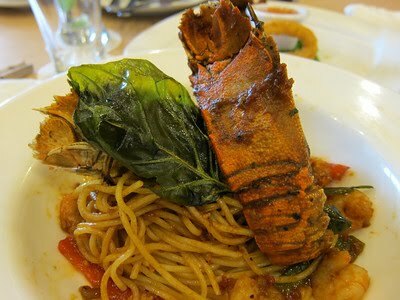 To order the cream sauce Char-Grilled Parchment Pasta or tomato sauce Spicy Seafood Parchment Pasta? You might end up fighting a battle within self, struggling to decide which parchment pasta to taste first… Well, it’s really depends on your personal preference of flavour. Or, I shall suggest you to patronize Pizza Hut again the next day to have it both in two separate visits. After all, these pasta dishes in Pizza Hut are so affordable and worth-while, for the generous portion served in each order. That’s right! For all I enjoyed pasta dishes, I focus only the best deals. 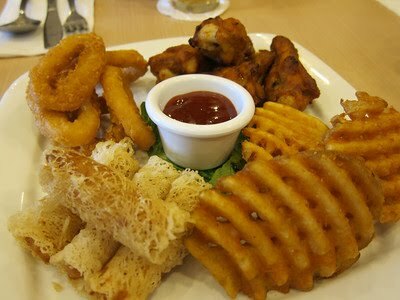 I always know that one of the best places to go for affordable great pasta dishes is the Pizza Hut restaurant. And I am even more convinced now, after the tasting, I will not be bored to rhapsodize about my eating pleasure on these two awesome Parchment Pastas, just like I did here. It’s not hard to tell, I liked this Spicy Seafood Parchment, for its spicy tomato sauce as my personal preference. 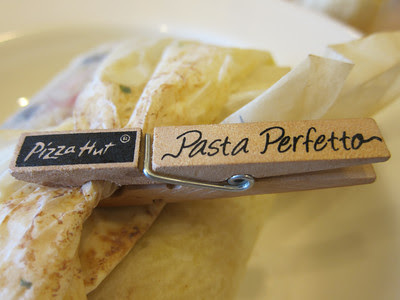 I know I’ll be ordering these again in my next visit to Pizza Hut restaurant, :) And, I can assure you that it will never be bored to have pasta in a row as each flavour brings a total different eating pleasure to your taste bud. Wait… there are more to come… Don’t you forget those other gourmet delights in Pizza Hut which provide an equally immense selection of satisfactory goodies that await your indulgence? There are really many other exquisitely delicious choices in the Pizza Hut Restaurant which surely provide you with an ultimate dining experience here. And there are some items I must share with you in particular, which I personally liked it so much (I am sure many do so). For weight-watcher (or you just feel like having just a light meal), please don’t think that you will be an odd-out in all the fast food restaurants. 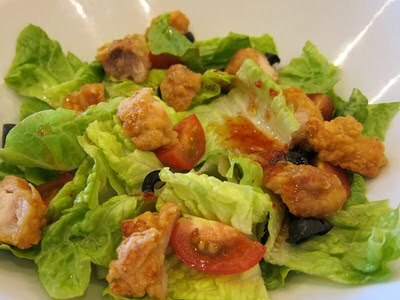 Pizza Hut has wide range of mouth-watering salad dishes! 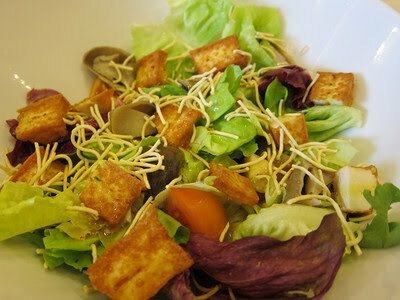 Salad is considered a good and refreshing starter to kick-start a sumptuous meal. I tried two salad dishes during the tasting session, the new seafood tofu salad with Italian dressing (and more interesting with the crispy noodle stripes to add crunches), and the well-liked Oriental salad (with crunchy chicken chunks) with Thai dressing. Gazing at the freshest mixed greens and generous amount of quality toppings, it’s indeed a great pleasure to enjoy such healthy food with these bountiful elements on the plate. If you ask me which is better between these two options, I could only tell you that seafood tofu salad is distinctive as we normally have the seafood tofu in hotpot, but now it’s found in this salad dish, a creative addition to enhance your eating experience of healthier diet, whilst Oriental salad should be your request, if you are looking for a more familiar kind of exotic flavour. It can’t be wrong to go for this subtly spicy-sweet Thai dressing and flavourful fried chicken toppings. And, you won’t fail to realise that these lavish salads are exceedingly worthwhile than what they are priced! Each costs only S$6.90, for a large salad bowl! It’s definitely a value-for-money. Wanting more varieties for appetizers? Want something more for main entrée? 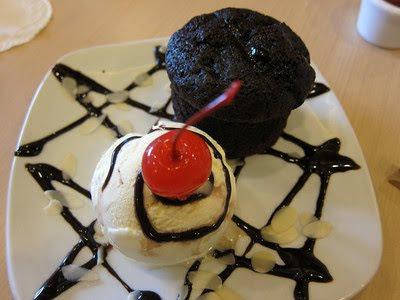 However, if you think it’ll be too full for dessert after that, yet do not wish to give up your affection for dessert. 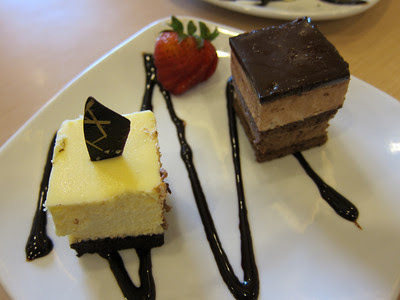 Simply have this, ‘A Tale of Two Temptation’, and let its grandeur helps to satisfy your sweet tooth. And so, given an opportunity like this, I would like to recommend what I have tried and liked. 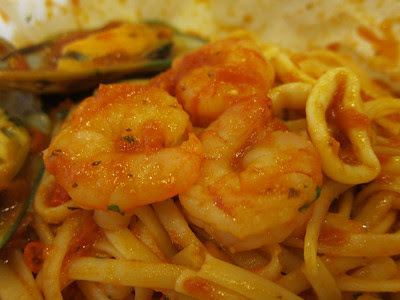 Of course, this includes the two new pasta delights which will be prevalent on their menus. And, don’t forget to bring home with you, the crafted cloth-clip souvenir from any of these Parchment Pastas! Do leave your comments to let me know how do you like it, after-taste, ok? It has been a while since I last heard from you months ago? I am glad that you sound great and still following my blog! 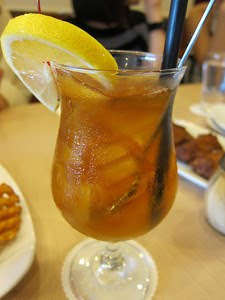 Great to hear from you again.. And yes, I ate ALL those food items featuring in my post. Everything was irresistibly good.